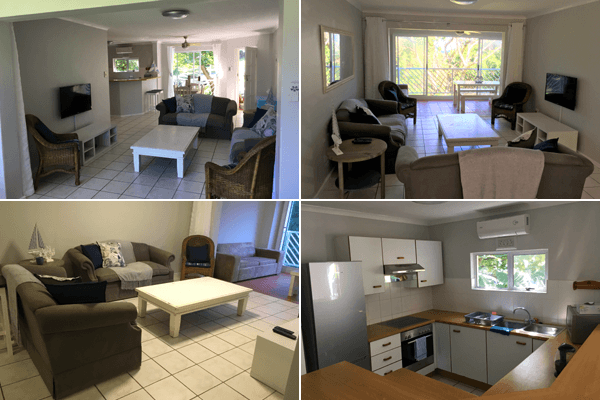 54 The Beacon is a modern upstairs unit, situated in Shaka's Rock, and is ideal for a beach side break away. This four-six sleeper is situated in a secure, gated complex and offers lovely garden and partial sea views from the patio. The pathway down to Thompson's Bay beach is a mere 30m outside the complex gate. 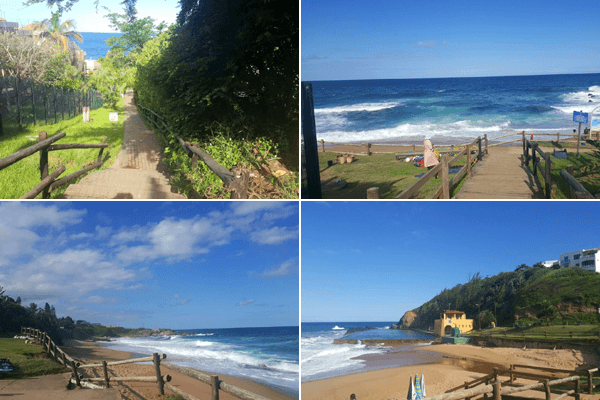 Thompson's Bay is one of the most popular beaches along the North Coast and is famous for its 90m tidal pool and the 'hole in the wall'. The Beach also has lifeguards 7 days a week. Perfect location for a family holiday. This apartment consists of 2 bedrooms and 2 bathrooms. The master bedroom has a queen-size bed with a main en-suite which has a shower. 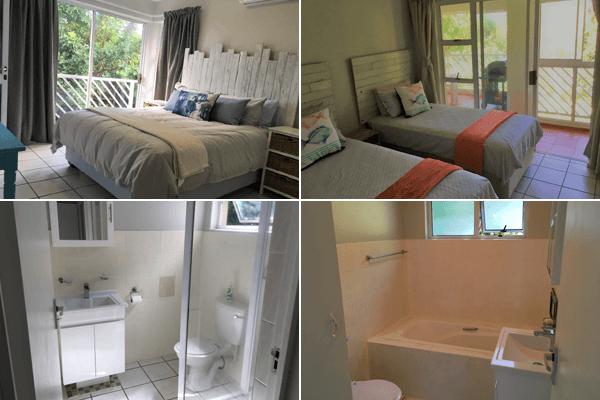 The 2nd bedroom has two single beds and the other bathroom has a bath. The kitchen is fully equipped and is fitted with new appliances. 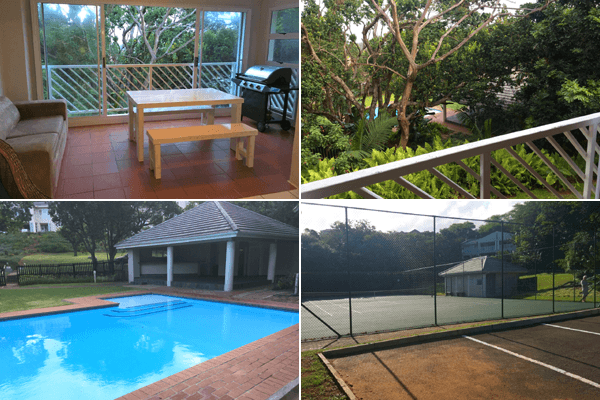 The open-plan living room and dining area lead onto a spacious patio with personal braai facilities. There is a sleeper couch on the patio which could sleep 2 children and a camp cot is also available for babies. The complex offers an attractive swimming pool which is in view from the patio and has an ideal shallow end for children. A tennis court is also available to quests. A 2-minute drive takes you to the centre of Ballito where you will find The Lifestyle Centre, Ballito Bay and the newly built Ballito Junction. King Shaka International Airport is only a 15-minute drive away. All linen is provided in the unit; however, guests are asked to bring beach towels. The unit has its own secure undercover parking. The complex operates under strict conduct rules, with specific emphasis on noise and number of occupants per unit, which ensures a comfortable, peaceful stay at a destination you will no doubt want to return to. The apartment is serviced before arrival, and once during the week for long stay bookings. Additional cleaning services are available on request at an extra cost of R200 per day. 50% Deposit required to secure booking and balance is due 14 days before arrival. 50% Cancellation fee for less day 30 days' notice and 100% cancellation for less than 14 days' notice, however if a booking is made for the same period we will refund 100% of the deposit.